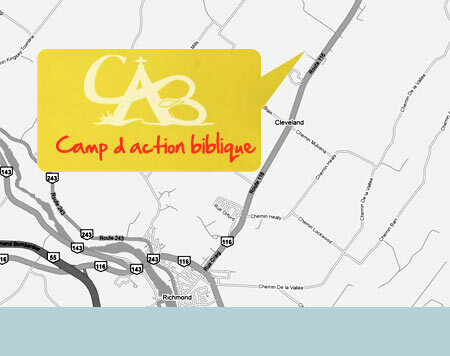 Camp d’action biblique is located at 422, Chemin du Camp off Route 116, 7km east of the town of Richmond in Quebec’s Eastern Townships Region. If on Highway 20, take either exit #173 (Drummondville) to go down Highway 55 south to connect with Highway 116 at exit 88 or (especially from the Montréal area) exit #147 east to go along the 116 which goes through Upton, Acton Vale and Durham Sud to Richmond. Either way, you will cross the St. François River just before entering Richmond. Turn left at the second set of lights as you continue on Highway 116. Drive about 7 km. On your left you’ll see a car dealership with big letters ‘J.N. auto.com’ on the roof. Chemin du Camp is the first (dirt) road on your left. The camp entrance is about 300 meters on your right.